Ingrown toenails, technically referred to as onychocryptosis, is an often painful condition where the nail becomes wedged into the soft tissue of the toe often resulting in pain, redness, swelling and infection. These are all symptoms often associated with the condition however in some cases only mild discomfort is observed. Ingrown toenails are a very common condition that presents to a podiatry clinic. Males and females are equally likely to develop the problem and genetics plays a role in susceptibility. Whilst a lot of the time people are able to successfully treat ingrown toenails at home, those suffering from chronic conditions such as diabetes or experience severe pain and/or infection should always seek the guidance of a podiatrist. Wearing of tight, ill-fitting or narrow footwear. Nails edges are relatively fragile. Ill-fitting footwear such as heels, small toe boxed leather shoes or footwear worn a size too small, will put pressure on the edges of the nails forcing them to become wedged in the soft tissues of the toe. Nails should be cut STRAIGHT ACROSS with sharp edges being filed. Cutting nails too short or down the sides (rounded edges) can live spikes unseen until they cause pain and have to be removed. Direct trauma to the nail. Naturally occurring elongated or twisted (involuted) nails. Visiting pedicure salons which may traumatise nails or incorrectly cut them. On occasion, callousing and debris can build up underneath the nail sides of toes and give off ‘faux’ ingrown toenail symptoms but does not indicate the presence of ingrowing nails. Simple clearing of this debris is usually enough to provide immediate relief. Untreated or neglected ingrown toenails, may progressively get worse and more painful. As the infection worsens it can predispose a patient to further and often more serious infections such as bone infections and blood infections (septicaemia). In these extreme cases, urgent medical attention should be sought. 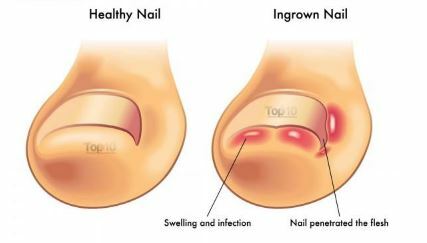 Most patients I have seen with ingrown nails, are able to be given relief with a simple resection (cutting) and removal of the ingrowing wedge of nail. Sometimes this can be done conservatively (partial nail clearing) or under a local anaesthetic in a procedure called a partial nail avulsion (PNA). Bathing your feet in warm, salty water for 10 minutes daily (table salt is fine). Apply betadine, or other strong antiseptic lotion, to the sore edge daily. Nail packing technique using cotton wool. Avoid tight or ill-fitting footwear. If your current footwear is inappropriate for your feet, consider purchasing newer shoes with a deeper toe-box to enable more space and less pressure to form. If symptoms persist, see your doctor for a course of antibiotics and see a podiatrist for further assessment and advice on treatments that may be appropriate. By visiting a podiatrist, you will be receiving a definitive diagnosis and a specialised treatment plan to not only help treat your ingrown nail, but also prevent it from coming back. Most treatments can involve cutting back of the ingrowing wedge of nail an clearing out of the sides (sulcus) of the toe to alleviate pressure and the irritating nail wedges. If the problem has been chronic (ongoing for more than 6 months), severely debilitating or deforming, susceptible to infections, then a patient may consider undergoing a partial nail avulsion (PNA) procedure. This procedure is performed under a local anaesthetic, and involves the podiatrist cutting away the ingrowing portion of the nail and removing it from the base of the digit. This is usually followed by a chemical cauterisation of the nail matrix at the removed section which would result a disruption in the nail forming cells functioning. This in turn, would mean that the ingrowing wedge will now no longer be growing back in the manner that has caused enough grief to the patient. The procedure is safe, effective and does not affect your ability to perform your daily activities, although a 2-3 day rest period is advisable. Ingrowing toenails are painful enough to disrupt your day, but they do not need to. If you, or someone you know is suffering from ingrowing toenails, please contact us and let our experience guide you on the road to happy and healthy feet.